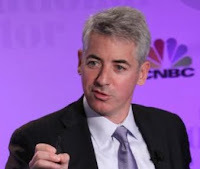 At the Delivering Alpha conference today, the keynote speech was given by hedge fund manager Bill Ackman of Pershing Square Capital Management. He revealed his latest investment idea: long the Hong Kong Dollar (HKD). Ackman's presentation began with a history of Hong Kong's currency. He said that very low interest rates in Hong Kong were driven by US monetary policy, which in turn will cause a Hong Kong housing bubble and high inflation. Ackman seems to believe that Hong Kong will end its US dollar peg by 2015. He says that US rates at zero provides a signal Hong Kong to re-peg. In terms of position sizing, Ackman says the trade is one of the smaller ones he's put on, but it has the potential to be the most profitable. He feels inflation will force the country to see its currency inflate by 30%. He argues that in 3-6 years, HKD could easily be convertible into the yuan. The Pershing Square manager also noted that if China implodes/has a hard landing, that's obviously bad for the trade. However, he feels that there's minimal downside mainly due to the fact that the HKD has been pegged to the US dollar since 1983. Ackman says there's 3 ways to play the trade: buy Hong Kong dollars outright, buy with leverage because the carry cost is low, or buy options on the currency. Ackman was buying in August and we detailed his investor letter where he bought $600 million worth of investments in various equities and apparently currencies as well. In late August, he revealed that he had bought shares of Family Dollar (FDO), Kraft (KFT), Fortune Brands (FO), and Citigroup (C). However, he also mentioned that Pershing had bought two new investments that he declined to name. Well, now we know one of them was the Hong Kong Dollar. In his recent letter to investors, Ackman compared one of the at-the-time-unnamed investments to that of his past play in General Growth Properties (GGP) where there was a chance of exponential return. This Hong Kong Dollar play seems to be the one he was referring to. The most intriguing thing here is the notion that Ackman has stepped into the global macro ring of investments. Typically, he has focused on equity and real estate-centric investments in the past. We'll have to see how his first major foray into macro bets plays out. You could join Ackman on this macro trade as Bergen Capital tweeted that you can mimic this trade by buying "$100mm notional exposure of 1Y HKD calls at 7.50 strike (~4% OTM) for roughly $700k." Though while that's a 1 year trade, Ackman thought the peg wouldn't end until 2015. This leaves one more unnamed investment from Pershing Square. Perhaps Ackman will reveal it at the upcoming Value Investing Congress? We've also posted Ackman's slideshow presentation on the Hong Kong Dollar.